Film and video production can take many forms, from television news production to commercial production to documentary and feature filmmaking. At Notre Dame, the Film, Television, and Theatre department teaches production as an art form. Not only do we prepare undergraduates to enter the industry with a solid technical background, but most importantly, we challenge students to be creative and to infuse their work with a personal vision that is characteristic of all artists. The production process is communal. No one person can produce a film. It’s a group effort, and the Film Production Track of Summer Scholars allows students to work closely with their peers as crew members and creative collaborators, learning from each other and making friendships which last well beyond their two weeks on campus. Students will learn the history of motion pictures, study the craft of filmmaking, and actually produce and direct their own short film which will be screened at the end of Summer Scholars inside the state-of-the-art THX Browning Cinema in the Marie P. DeBartolo Performing Arts Center right on Notre Dame’s campus. Enter the Force For Good Film Festival Contest to win a scholarship as a student in this track! Please view the Force For Good Film Festival website for more information. Ted Mandell (M.A. University of Iowa, B.A. University of Notre Dame) has taught film and video production at Notre Dame for the past 30 years. He specializes in documentary production and is also in charge of student development for Fighting Irish Media. 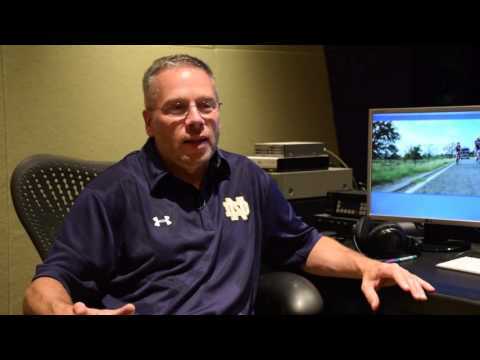 Producer of numerous features on Notre Dame Athletics for WatchND.tv, Ted is co-director of the documentary 88 and 1 (ESPN2), the award winning documentary Okuyamba, and producer of the Fighting Irish Media documentary series First Time Fans. Ted is also in charge of the annual Notre Dame Student Film Festival, has penned numerous national op-ed columns on media and popular culture, and is the author of the multimedia book Heart Stoppers and Hail Marys: The Greatest College Football Finishes (since 1970).